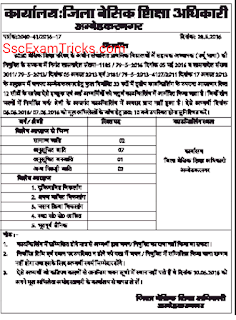 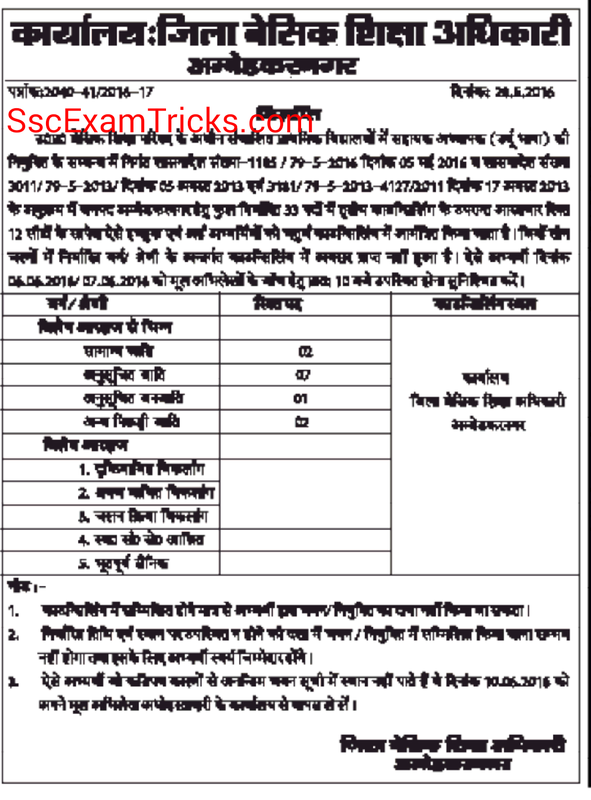 UP SSA Teacher Result 2016 - Download UP Urdu Teachers Result 2016 – UP Urdu Teacher Result Merit List 2016 Latest News - Download UP Primary Teacher (Urdu) Scorecard / Marks list Cut off 4th 3rd 2nd 1st Counseling date of All districts on upbasiceduboard.gov.in. 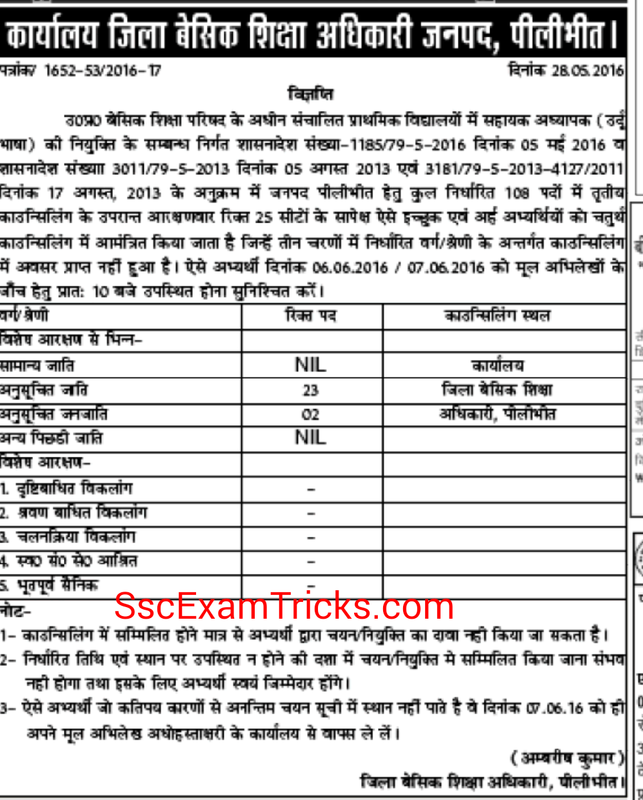 Latest News (30.03.2016): UP Urdu Teacher Basti district cut off marks can be checked in the below image. 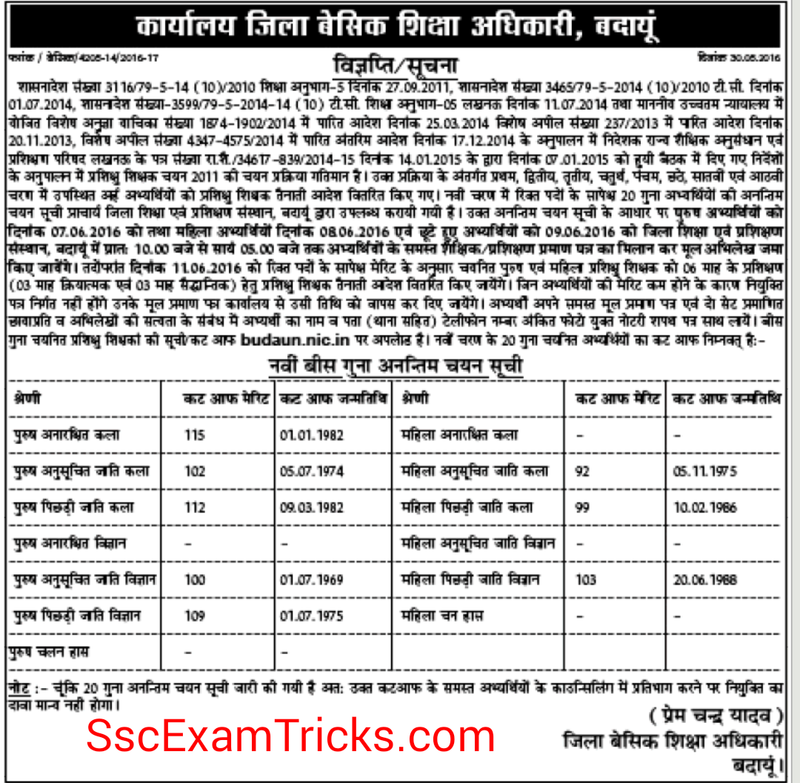 UP Urdu teacher counseling for Aligarh, Kanpur Dehat, Mirzapur, Mau & Hathras cut off: Read Vigyapti given in the image for counseling schedule. 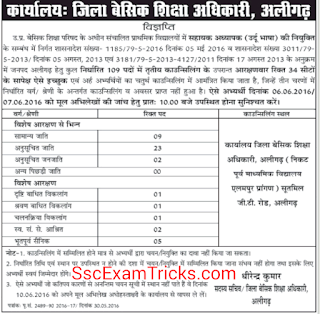 UP Urdu 3rd Counseling for Farukhabad cut off (27.05.2016): The 3rd counseling for 21 vacant posts in Farukhabad of 3500 Urdu teacher has been scheduled on 28th May 2016. 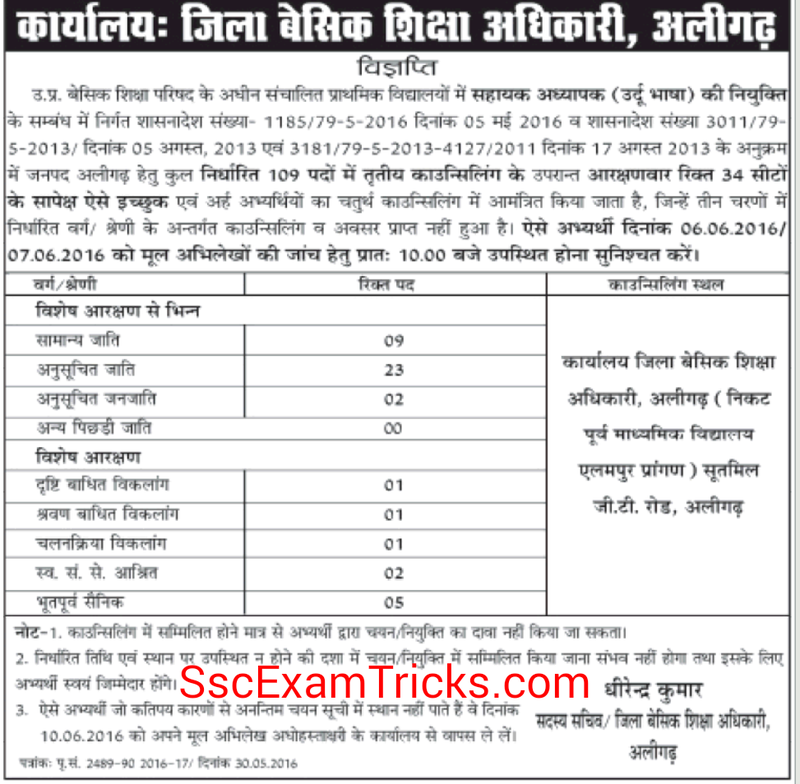 UP Urdu Teacher Firozabad 4th Counseling Cut Off: (27.05.2016)- The latest news is that UP BTC has announced 4th counseling date for firozabad district. 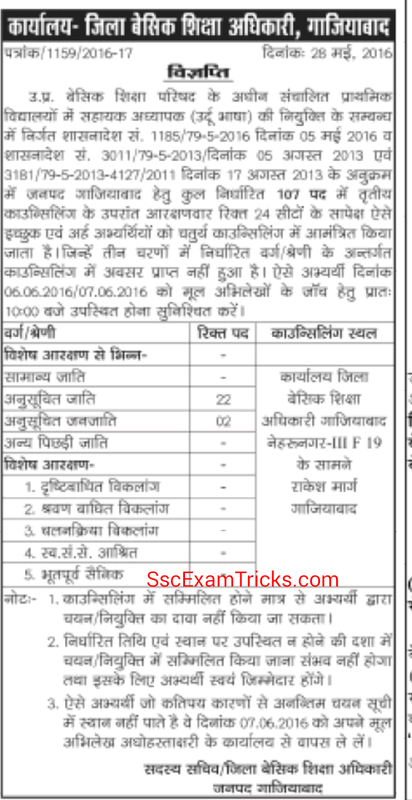 The counseling date is 28.05.2016 at the address mentioned in the image given here. 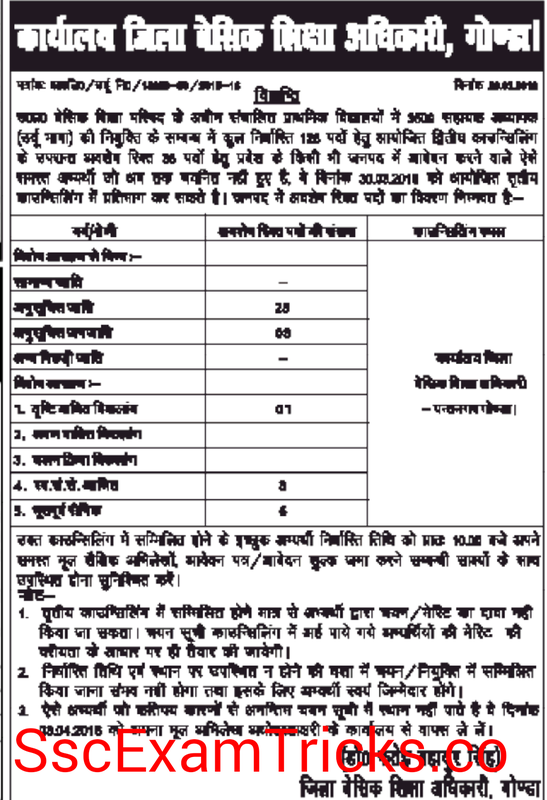 UP Urdu Teacher Gonda 2nd Counseling Cut Off Marks: The cut off marks for each category is shown in image below. 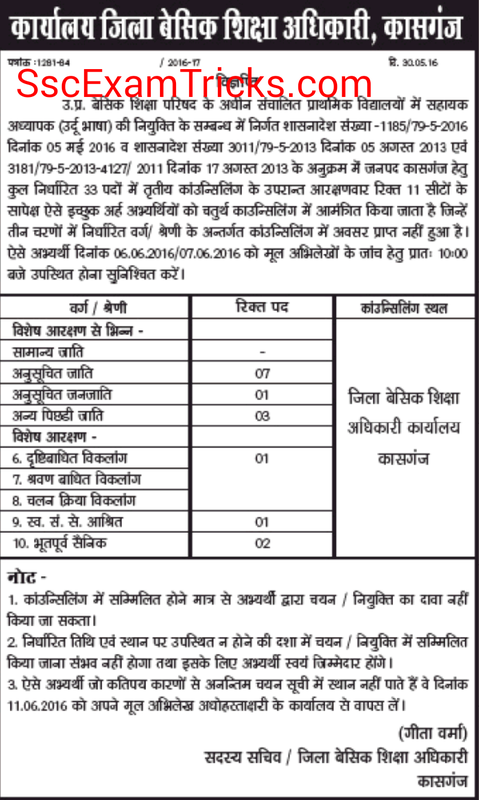 The 3rd Counseling date can be checked also. 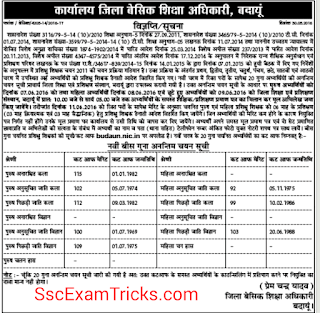 UP Urdu Teacher Hardoi 2nd Counseling Cut Off Marks: The third counseling date and 2nd Cut off marks has been declared that can be checked here. 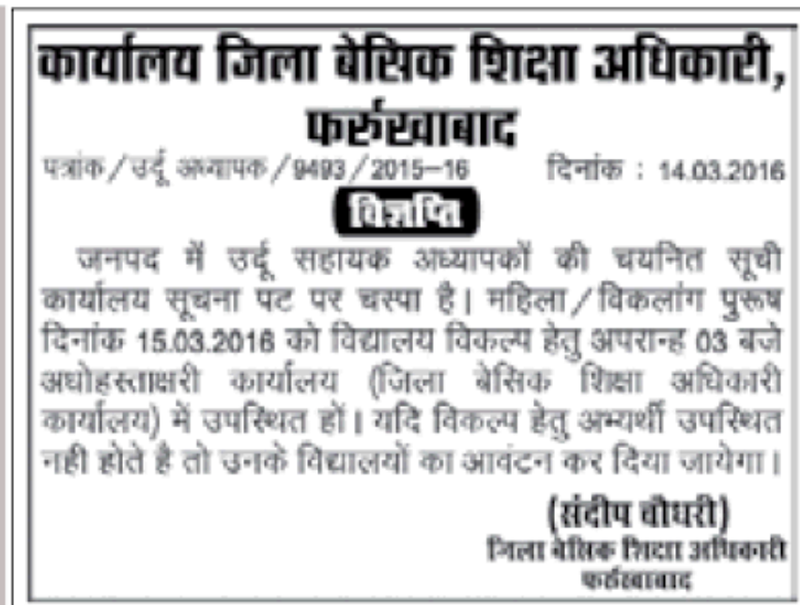 UP Urdu Teacher Auriya Counseling Cut Off: The cut off marks is displayed here with counseling date. 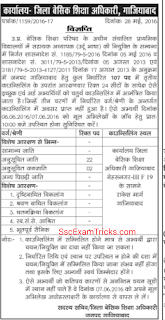 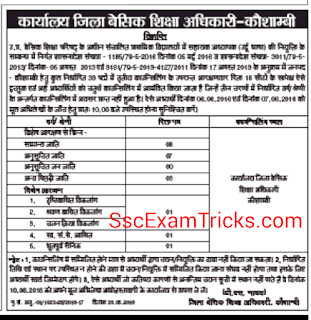 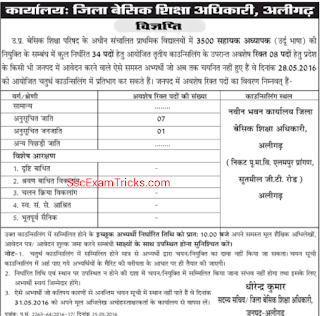 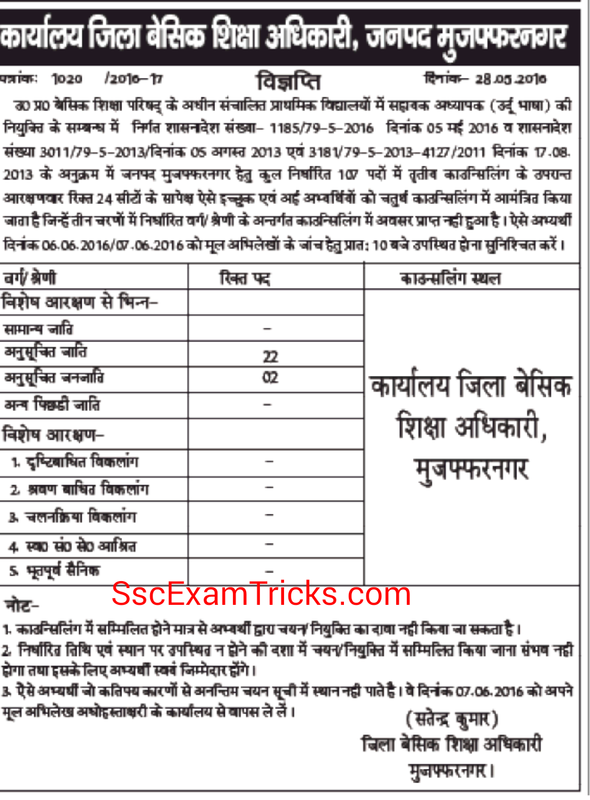 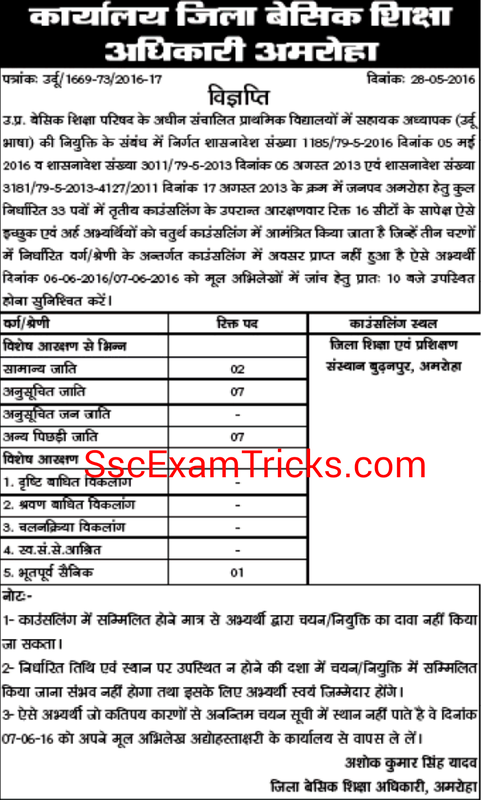 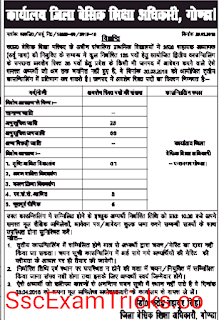 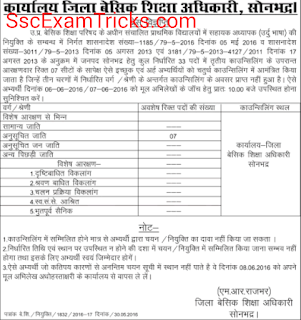 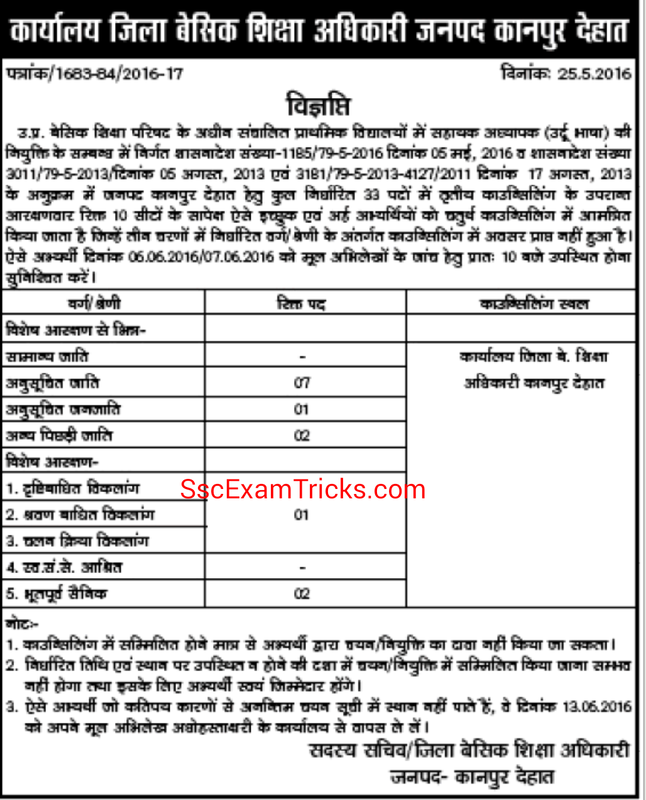 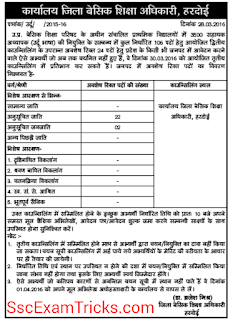 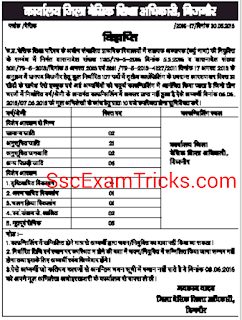 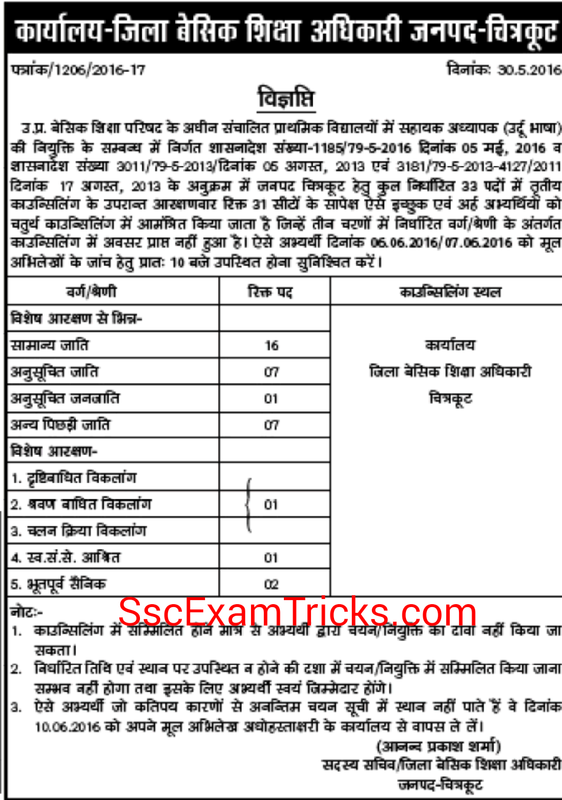 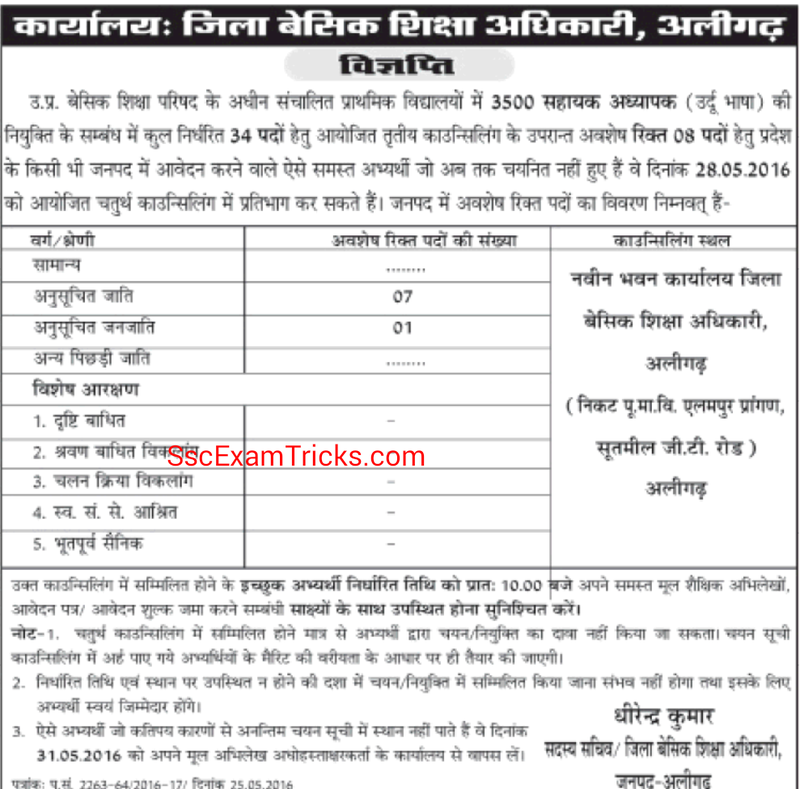 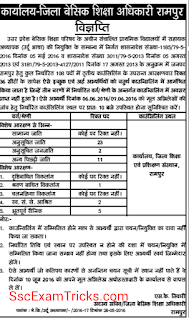 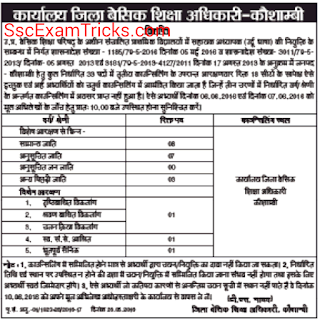 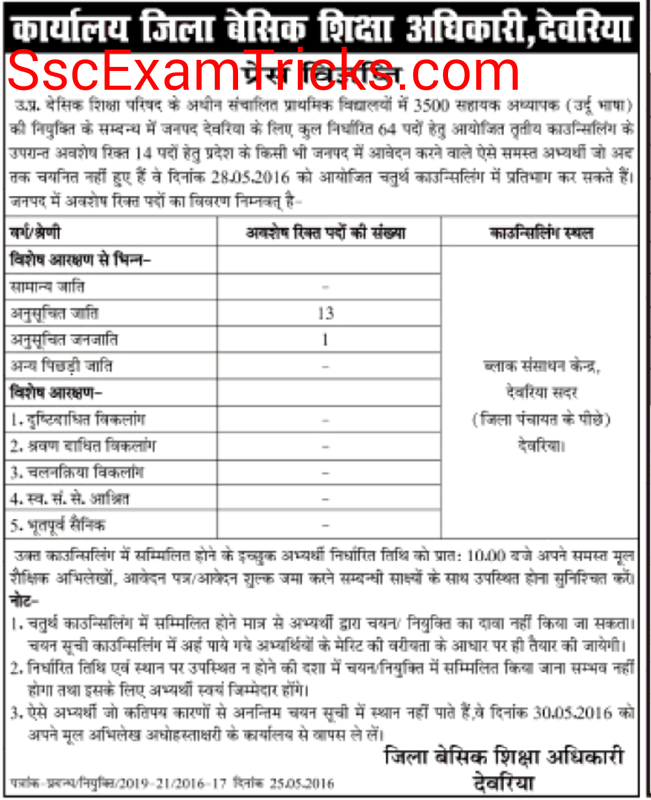 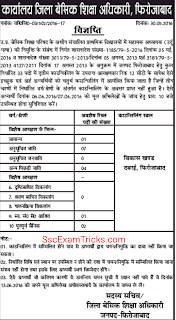 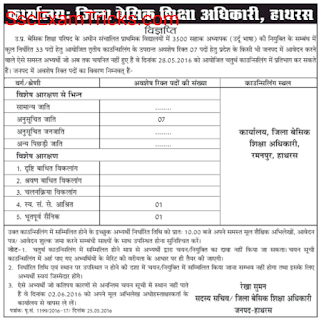 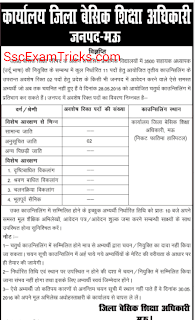 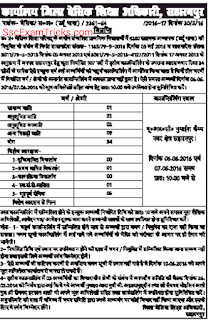 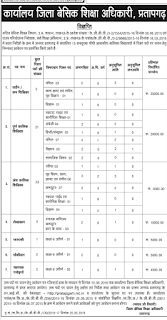 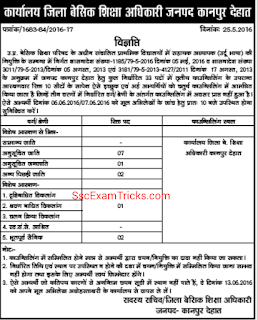 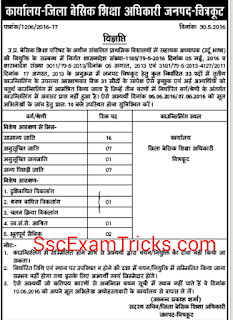 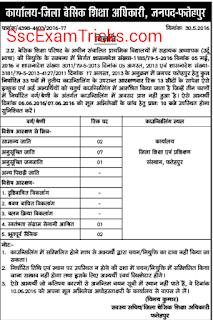 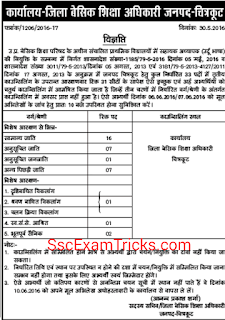 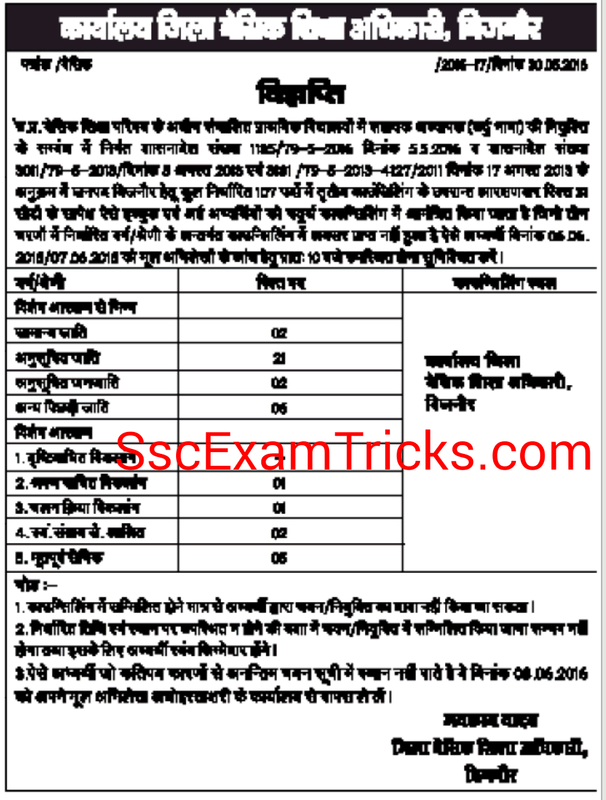 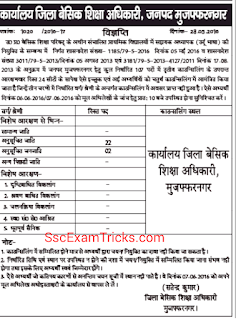 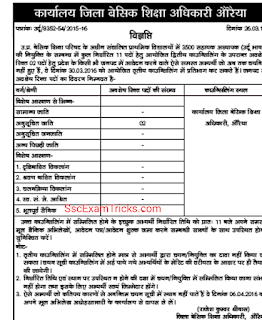 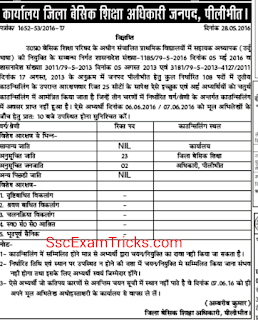 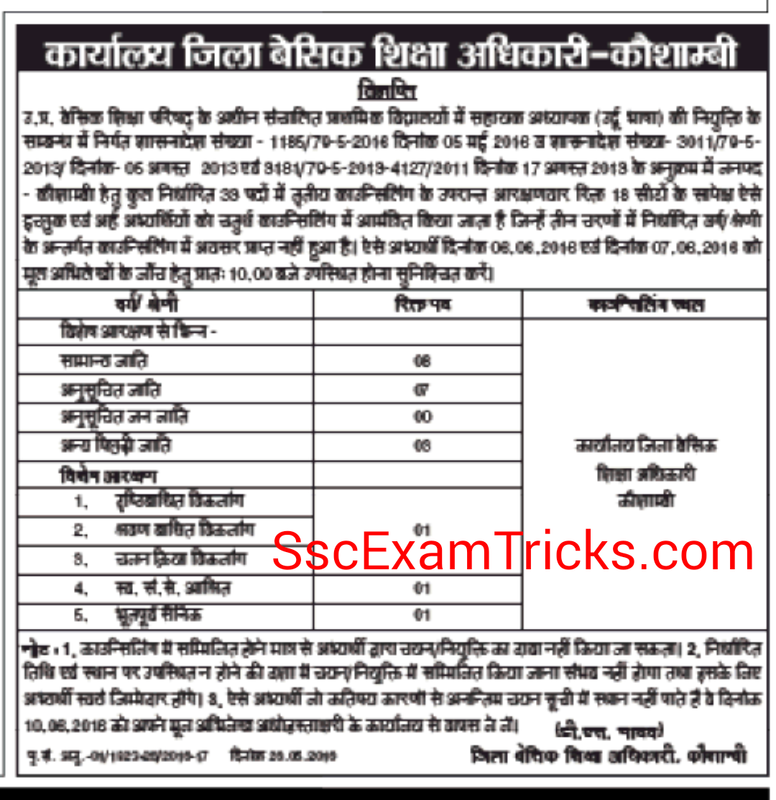 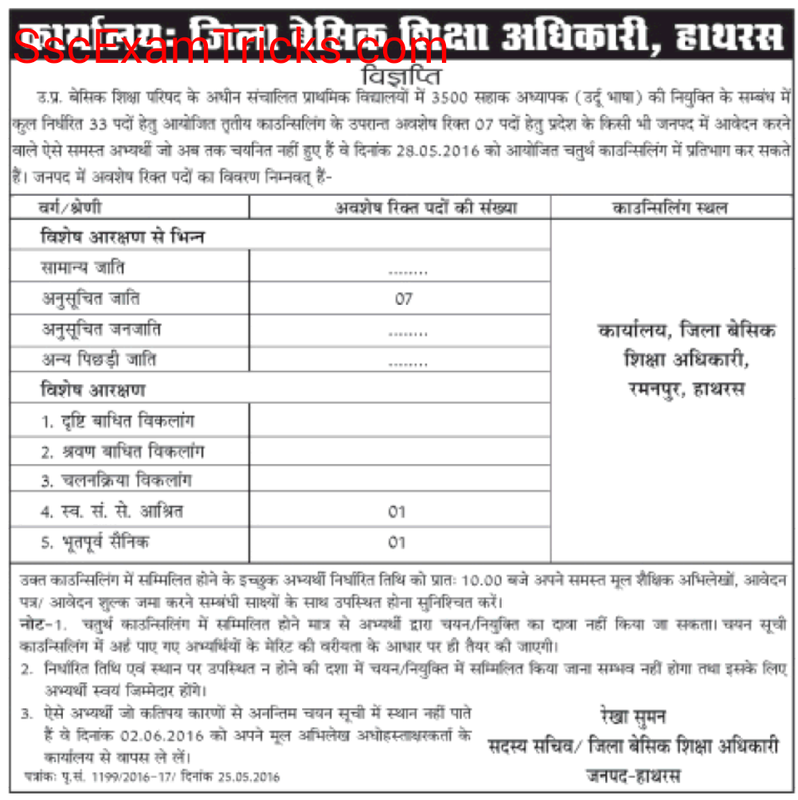 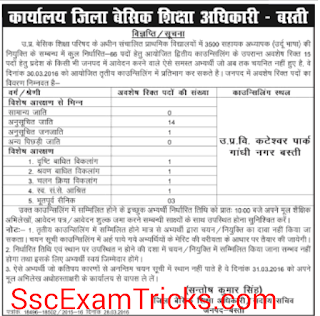 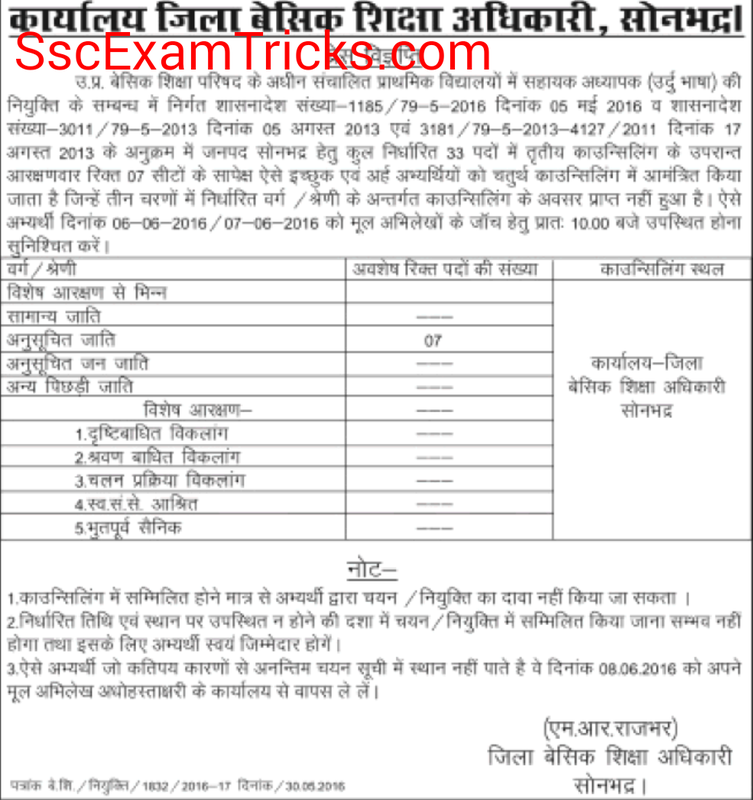 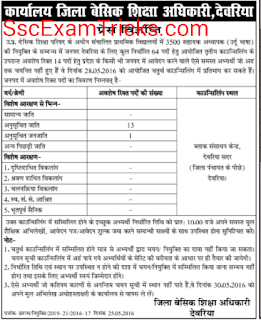 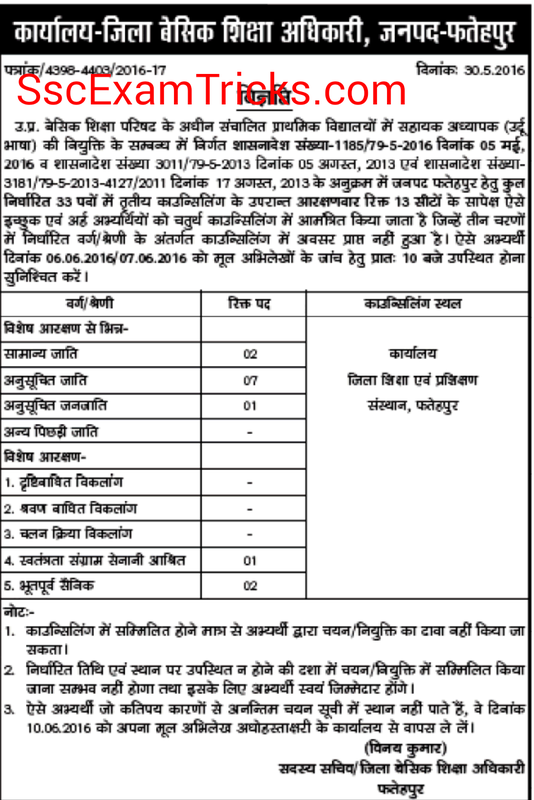 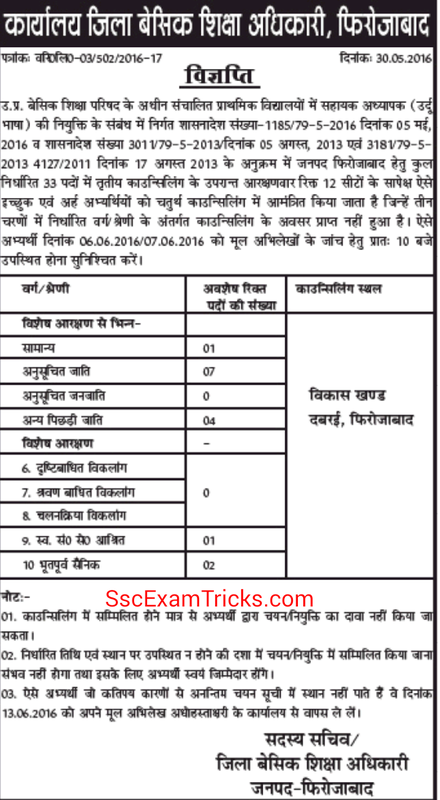 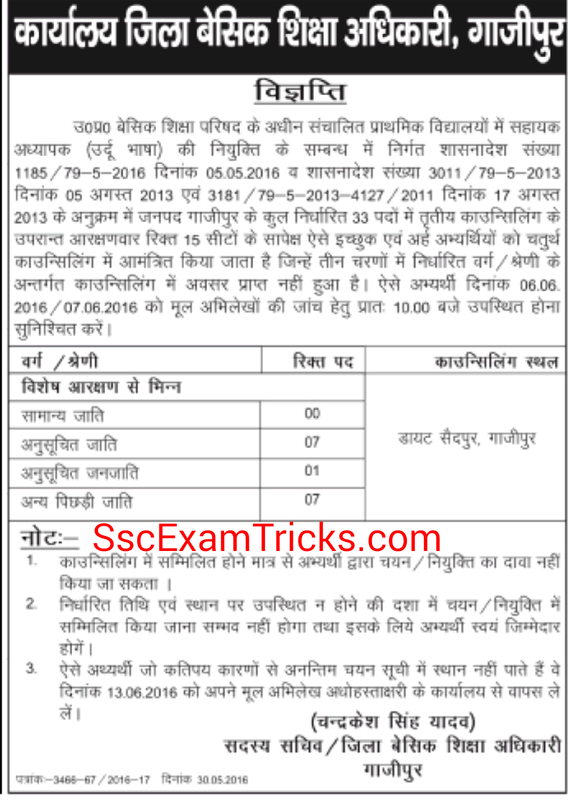 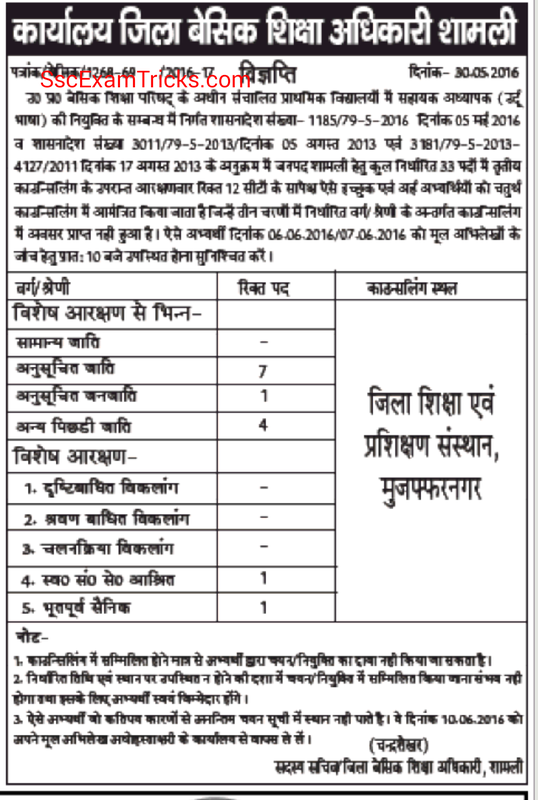 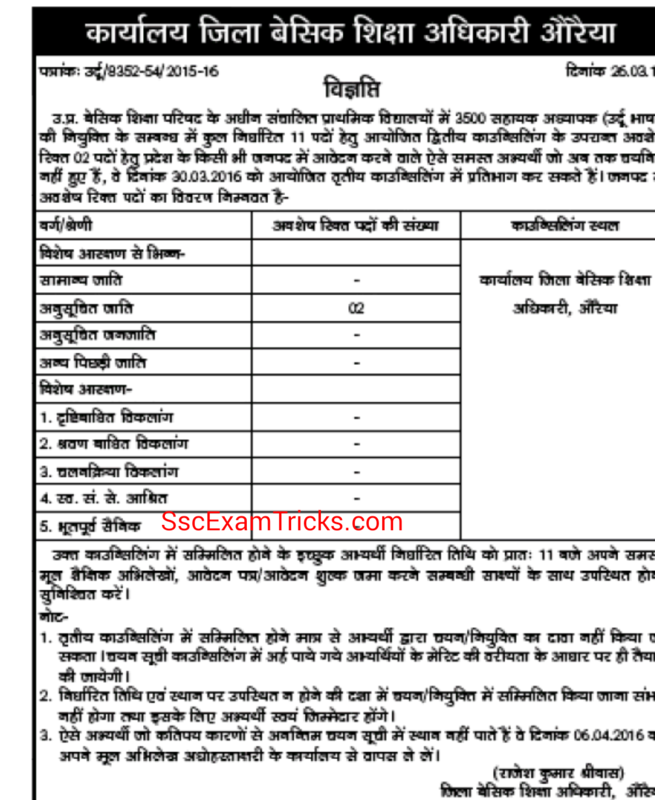 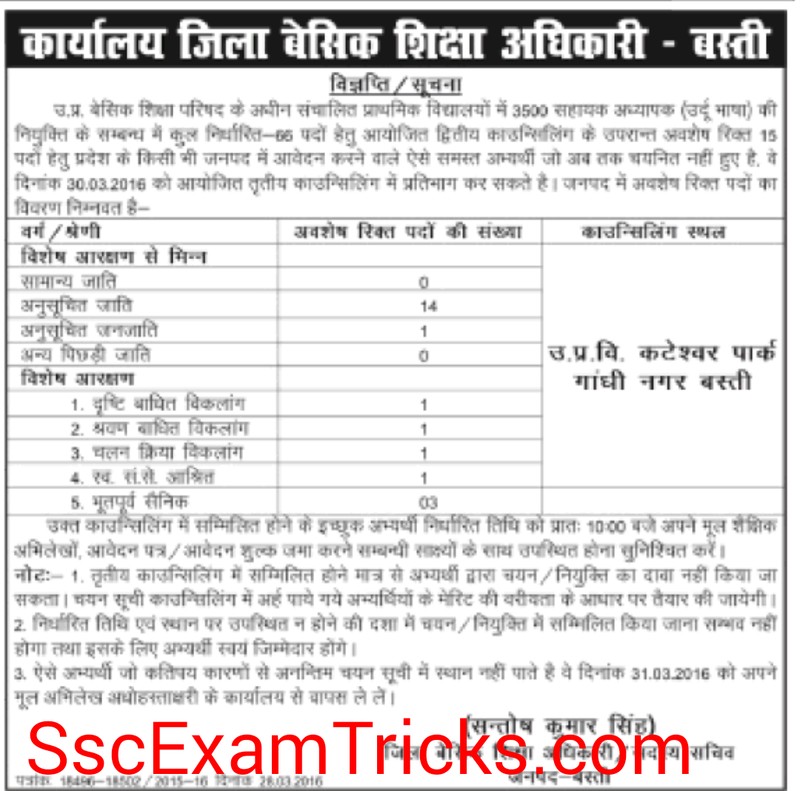 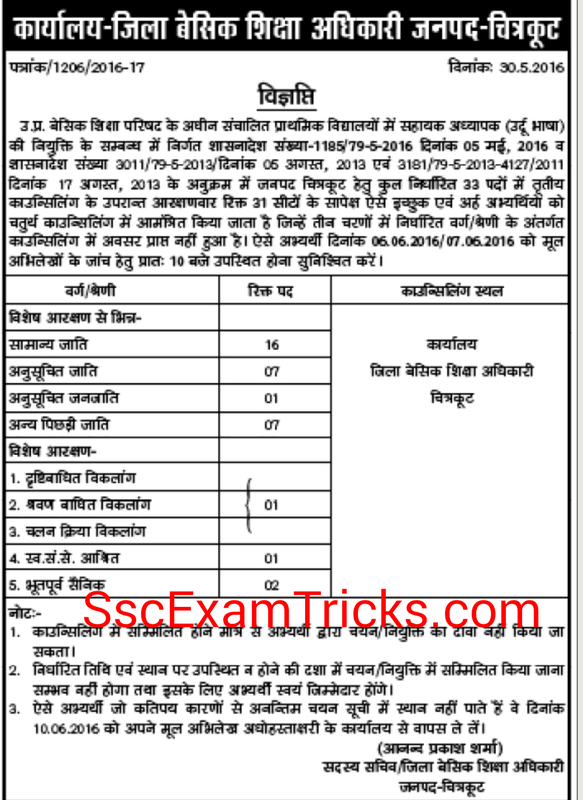 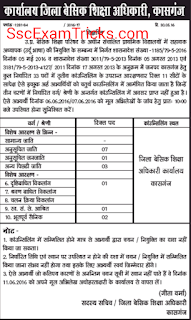 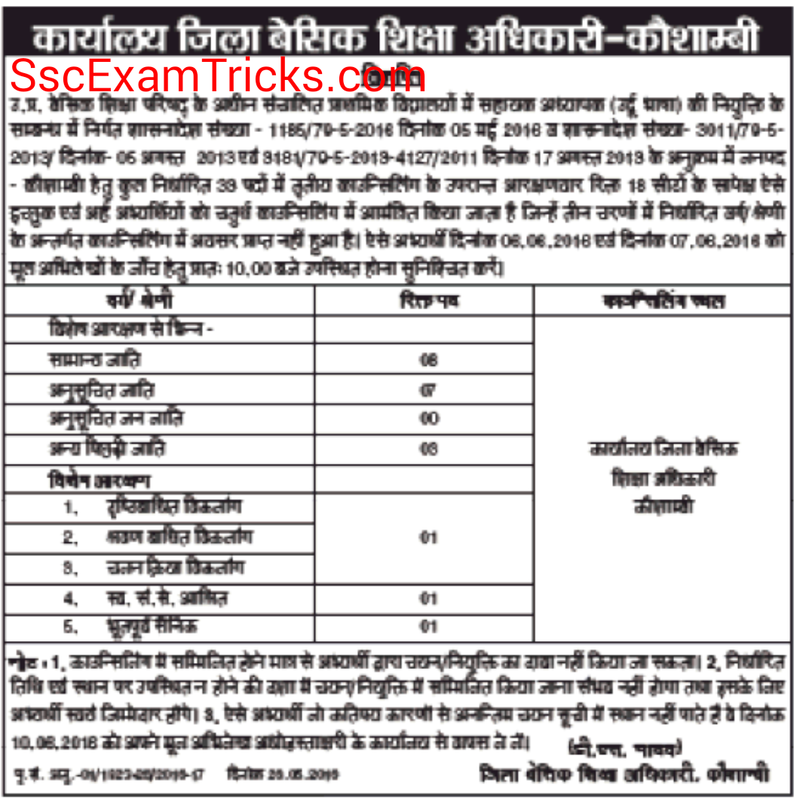 UP Urdu Teacher Balrampur Counseling date: The vacancy list can be checked here. 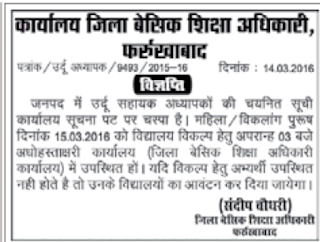 Latest News (15.03.2016): UP Urdu Farukhabad Vigyapti can be read from image given below. 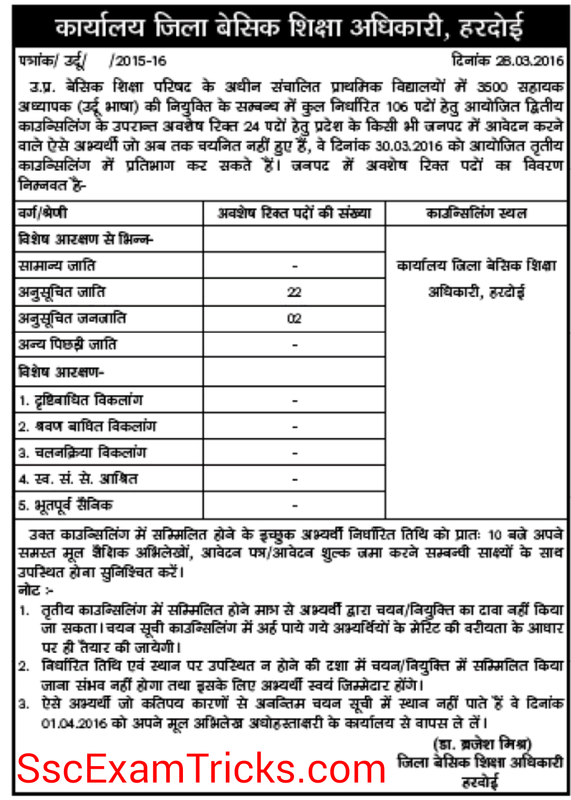 Pradesh Basic Education Board is under process to select UP SSA 3500 Urdu Teachers based on the merit list prepared from written test and making assessment of educational qualifications or marks obtained in the academic subjects on the official website www.upbasiceduboard.gov.in. 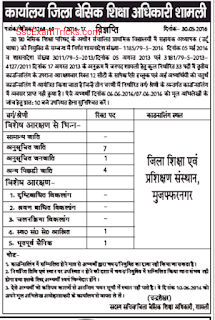 The recruitment process is conducted under Sarva Shiksha Abhiyan (SSA) to select suitable candidates for Primary Teacher of Urdu subject. 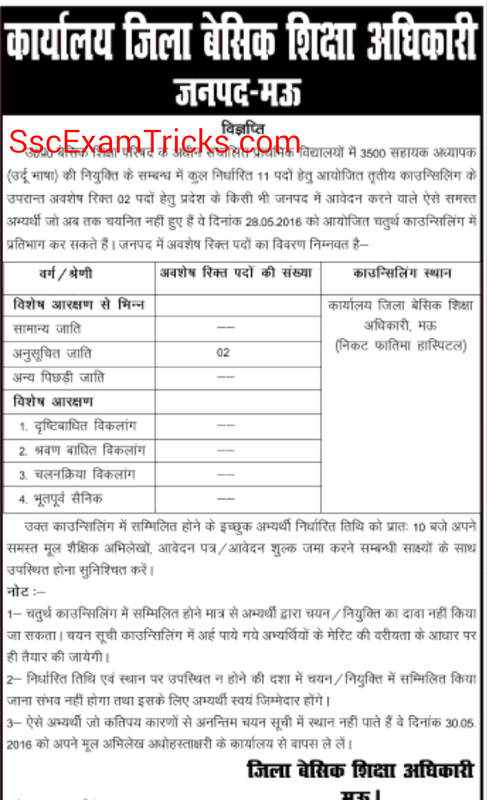 process of UP SSA Urdu recruitment 2016 has been started in January 2016 and to be completed in February 2016. 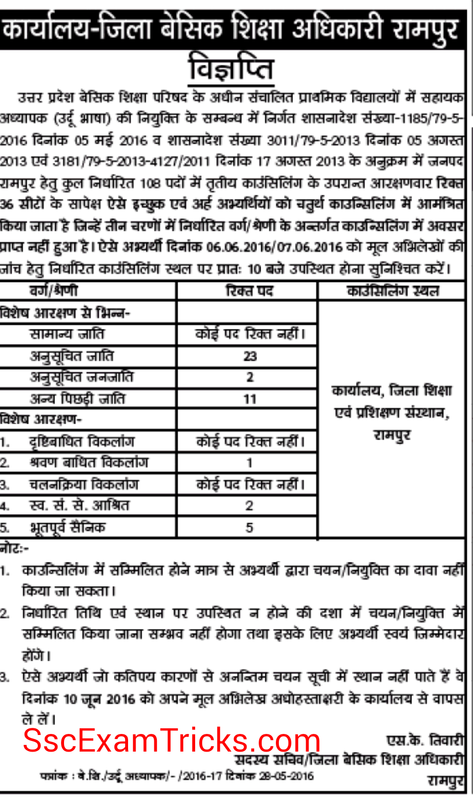 The final selection will be made through written test and personal interview. 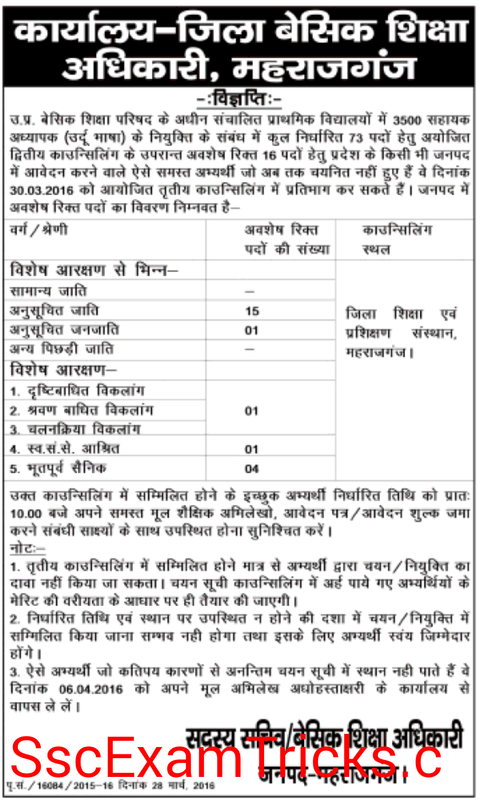 The interview process will be held with document verification. 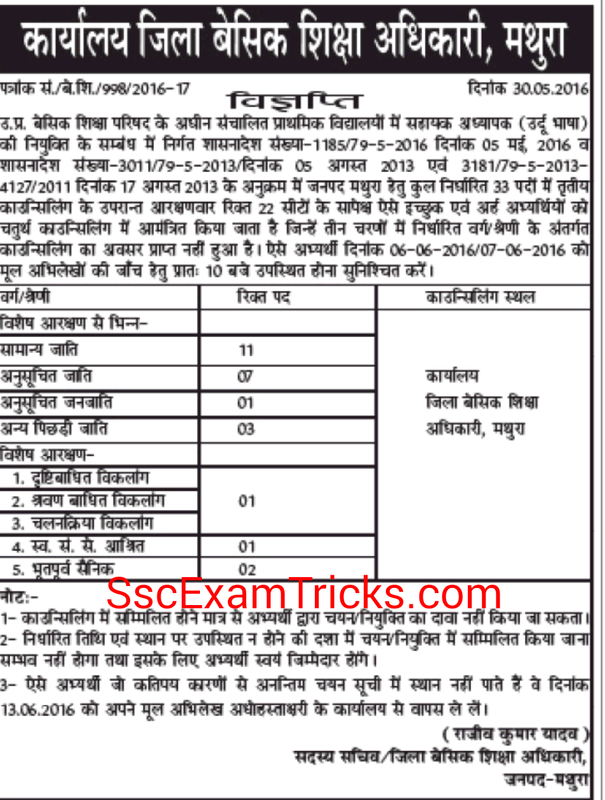 Those candidates who will qualify and attain minimum cut off marks in their category will be called for personal interview. 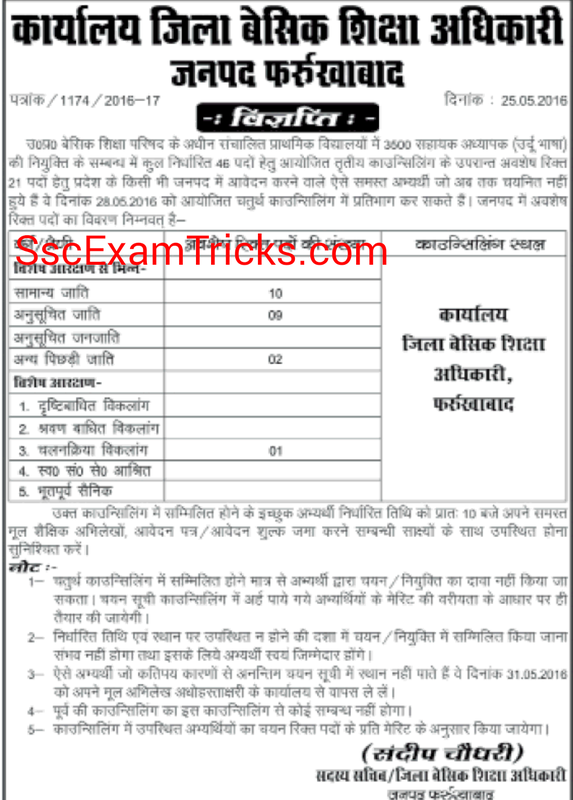 The latest news and updates of UP SSA 3500 Urdu Teacher result / merit list 2016 will be given regularly to you via this page. 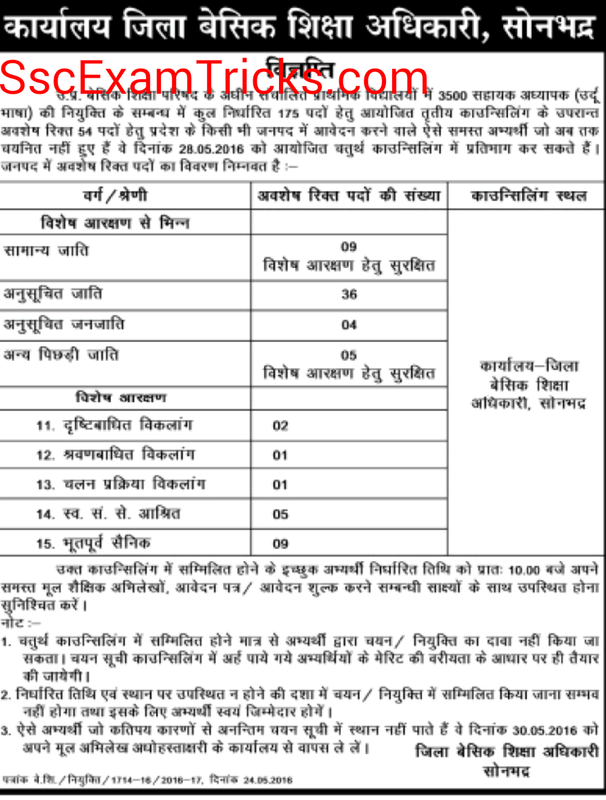 Those candidates who have applied / filled successfully their online application form by registration process and paid their application fee; they must be eligible to be called for written test to be conducted at many centres/ exam centres by UP Education Board. 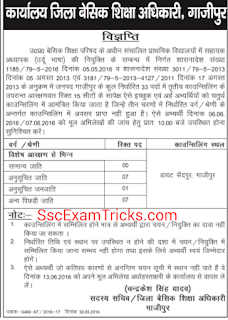 The date, time and venue of exam will be mentioned in UP SSA Urdu Teacher Admit Card 2016. 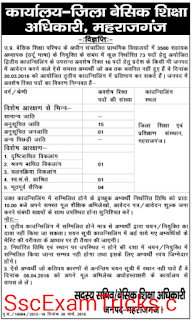 The admit card is compulsory to attend written test with a valid ID proof of the candidate. 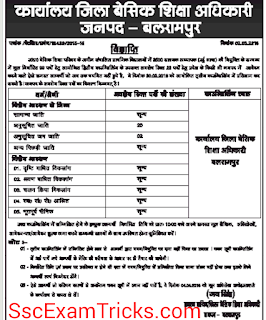 The UP Urdu Teacher exam date will be available very soon on upbasiceduboard.gov.in. 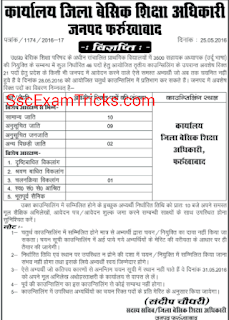 The written test will be held by conventional mode in which multiple choice questions will be asked from various topics; Reasoning, English Language, General Awareness, Quantitative Aptitude and Urdu subject related questions. 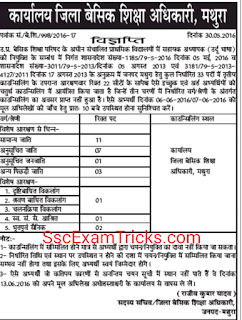 The UP SSA Urdu Teacher exam result will be published on upbasiceduboard.gov.in. 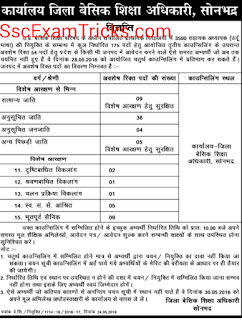 The scorecard/ marks obtained by the candidates will be uploaded on the official website. 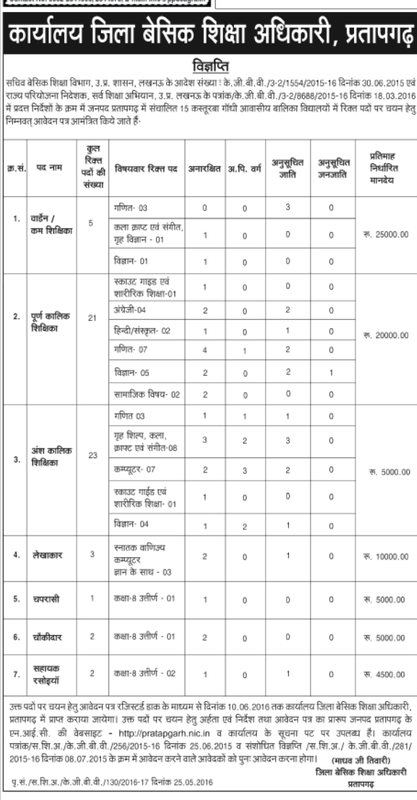 The minimum cut off marks will be set and three times more than required (about 10,000 candidates) will be shortlisted and called for interview session. 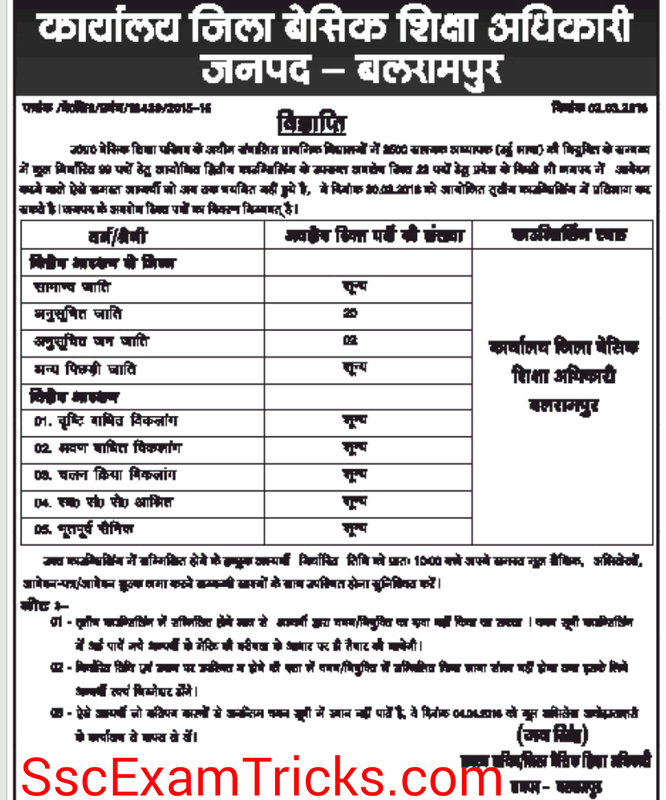 The final merit list will be prepared from written test marks and interview marks achieved by the candidates. 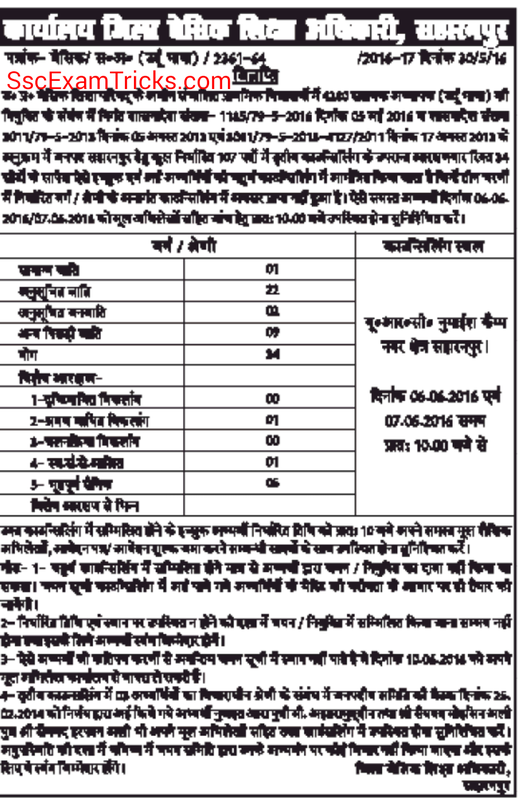 The appointment letter will be issued to those candidates who will score higher marks in written and interview test.